There are many methods of teaching used in classrooms across the world. Some teachers focus more on testing, others on free-thinking environments. Then there are teachers who throw chairs at your head and verbally assault you. One of the many prestige films sure to be talked about this awards season, “Whiplash” presents its audience with the high-stakes world of jazz music. Often seen as a dying genre, those who possess true talent have to prove their worth or burn out in the process. When young drummer Andrew (Miles Teller) is invited to play in the prestigious studio band at his conservatory, he learns that he will have to overcome the abusive teaching methods of its conductor, Terrence Fletcher (J.K. Simmons). if he is to be one of the greats. Originally a short film starring Simmons, writer/director Damien Chazelle adapts his initial idea to fill a larger storyline. It isn’t the first time he has based one of his films around the world of music, though it is by far his best effort. Last year’s “Grand Piano,” which Chazelle wrote for, was a thriller about a pianist who is targeted by a madman sniper and forced to play perfectly or be killed. Though there are less guns involved this time, the stakes are still pretty high. The driving force of the film is the performance by Simmons as the cutthroat conductor. Bouncing back and forth from humor and villainy, his character is the one that will keep you from checking your watch. Here’s a little taste to get you interested. For years Simmons has been excelling in a variety of roles like “Juno,” “Spider-Man,” and “Up in the Air.” Even though he isn’t the star of the film (Teller is also great), this is Simmons’ shining moment. As you would expect from a film like this, the music is also fantastic. From its early moments to its powerful conclusion, almost every scene involves some top notch jazz arrangements. There’s also a lot of talk about greats like Charlie Parker and Buddy Rich to please fans of the genre. The further that Andrew dives into his music, the more obsessed he becomes. Risking his health and cutting off those close to him, he adjusts everything in his life to the outcome of him being one of the greatest jazz drummers of all time. At times this can lead to some scenes that are hard to believe if you’re more of a realist, but the film tries to fly past it before your suspension of disbelief is too rattled. Without spoiling the ending, the film’s conclusion is a powerful one that could lead to some good conversation on the way home. Most films either entertain or make you think. 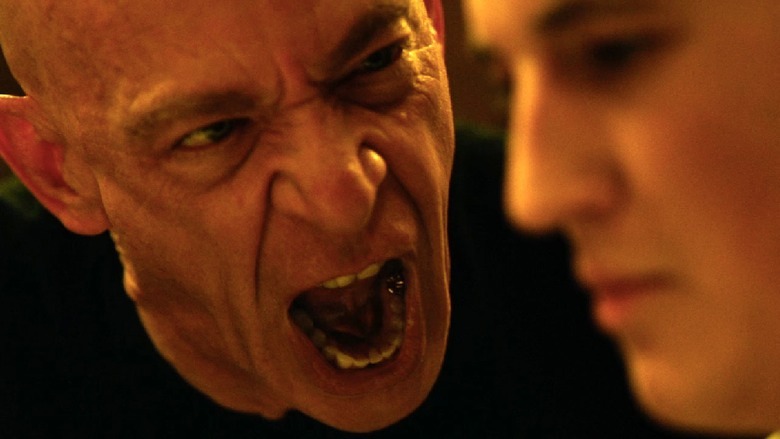 “Whiplash” is one of the select few that might just do both.